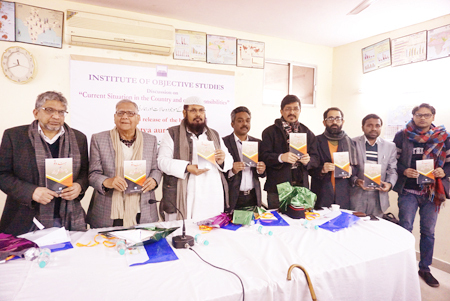 A discussion on “Current Situation in the Country and our Responsibilities” was organised by the Institute of Objective Studies in its conference room on February 2, 2019. 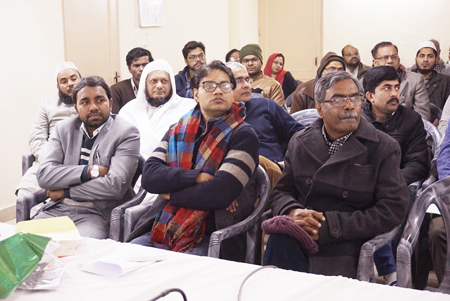 Initiating the discussion, Maulana Abdul Hameed Noumani, secretary general, All India Majlis-e-Mushawarat, said that Hindutva and nationalism had generated an intense discourse after 2014. Attempts to present Hindutva as a way of life were being constantly made to thrust this ideology on people, and those who did not subscribe to it were dubbed opponents of nationalism. Hindutva advocates were forcing people to raise slogans like “Jai Sri Ram” as against the Muslims who never asked anybody to compulsorily raise slogans like “Naara-i-Takbeer”. According to the votaries of Hindutva, Rashtravad or nationalism was linked to a faith community, i.e., Hindus. This sectarian ideology was fraught with danger in a plural society like India. Plurality had so far bound Indians together and they could sustain themselves as a nation as the diversity of culture, religion and society, worked as a glue. He pleaded for promoting communal harmony to end this threat. Calling for a debate on the issue, he noted that the Hindutva ideology presented a particular community as ruler and the rest as ruled. 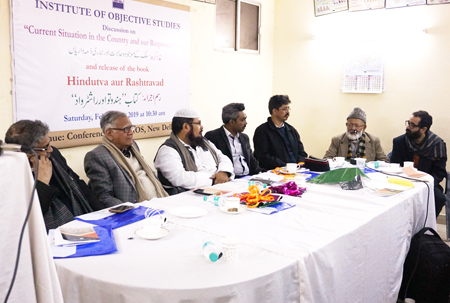 Referring to his book, Hindutva aur Rashtravad (Hindutva and Nationalism), which was released on the occasion, he said that the ideologies of MS Golwalkar, Maulana Husain Ahmad Madani and Maulana Abul Aala Maududi, had been discussed in the book. He dismissed the theory of ek qanoon aur ek bhasha (one law and one language) as a sinister design to impose Hindutva ideology on the people who belonged to different religious and linguistic traditions. Abhay Kumar Mishra, a research scholar at the Jawaharlal Nehru University, held that since Narendra Modi came to power at the Centre in 2014, the BJP became aggressive. On assuming office as Prime Minister, Modi had declared that the country was liberated from thousands of years serfdom. Commenting on Savarkar’s book Hindutva written in 1926, he said that he hid several things and made no mention of them. Terming the book a fabricated story of Hindutva, he observed that it had no reference to other faiths. While referring to several hundred years of Muslim rule in India, Savarkar willfully maintained silence over the British rule. From that point of view, it was a very powerful book, he said. He likened Hindutva to a termite which was eating into real religion. His brand of Hindutva had nothing to do with daily rituals as it was meant to politically unite Hindus. Dividing the Indian history into three parts, viz., ancient India which meant Hindu India; Medieval India; which meant Muslim India and the Modern India, which denoted British rule, he maintained that the Medieval History must be critically analysed to demolish the theory of Hindutva. 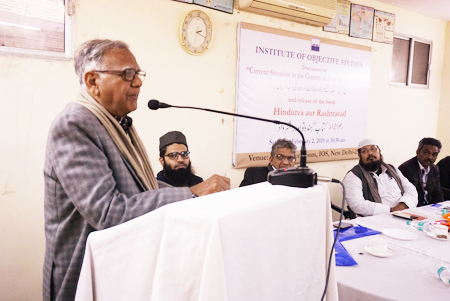 During the British Raj, the role of the Deoband School in the freedom movement had been significant. He said that the nationalist Muslims, including Maulana Abul Kalam Azad, always opposed the concept of nationalism based on religion. 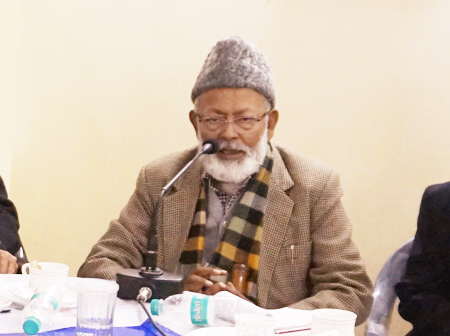 The Jamiat-ul-Ulema-i-Hind, the umbrella organisation of ulema (Islamic scholars), wanted that Islamic law should not be interpreted by the majority or majoritarian government. But a problem arose when the Muslims themselves pursued such policies as were inimical to the community’s interests. In this regard, he referred to Abdul Rehman Antulay, the then chief minister of Maharashtra, who got a resolution passed in the Assembly to ban polygamy. This was due to a different line taken by the state leadership during the period the Congress was at the helm. State satraps of the party used to differ with the Central leadership on a host of issues. He opined out that besides India, there were a number of countries in the world where ethnic and cultural diversity existed. He said that the upsurge of Hindutva had an economic dimension, too. Big business had been providing financial support to the RSS. He maintained that Prime Minister Narendra Modi was working for big business more than the RSS did. If it was easy for the RSS to bring down the Babri Masjid, it was not difficult for the Sangh to build Ram temple at the disputed site. He insisted that reservation for the OBCs was being systematically scrapped. To begin with, the universities were being asked to fill the quota for reserved categories department wise, instead of university-wise, he added. 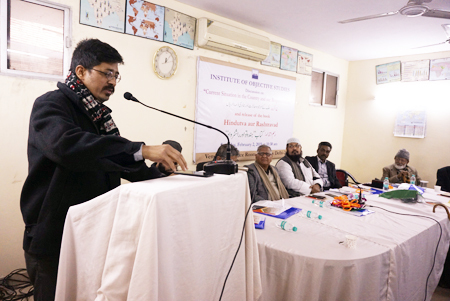 Prof. Saroj Giri of the deptt. of political science, University of Delhi, commented that Hindu militancy existed before the RSS came into being. The writings of Bankim Chandra Chattopadhyay had the content, including Vande Matram that pointed towards militant Hindu nationalism. He maintained that the present brand of Hindutva was diametrically opposed to the Vedas and the Upanishads. If we considered Vedas and Upanishads as Hindutva code, none of them had reference to Ram and Krishna. It was Tulsidas (in Mughal time) who synthesised this form of Hindutva by idolising Ram as a character wielding sword and other weapons to exterminate evil-doers. He also disagreed with secularists who believed that things would be better if Congress came to power. Some of them, however, considered it as a lesser evil compared to the BJP. But this perception was incorrect as things might not change appreciably. He did not subscribe to the opinion that the JNU symbolised hope of secularism and advanced studies. He said that the JNU had reached a saturating point where what was being produced was not worth the trouble. Referring to popular culture, he said that the people did not read Vedas and Upanishads, but they recited Hanuman Chalisa. Calling Kabir the first secularist, whose poetry reflected the true spirit of secularism, he said that Rabindranath Tagore was so impressed that he penned “One hundred songs of Kabir”. According to him, secularists failed to understand the real meaning of secularism as for them the slogan of Hindu-Muslim bhai-bhai symbolised secularism. This was a shallow approach to secularism. He said that when the Muzaffarnagar riots broke out in 2013, Congress was ruling at the Centre and the Samajwadi party had its government in UP. Still, the RSS engineered riots by testing a new strategy to displace Muslims more than killing them. He wondered about why Dr. Ambedkar, who was the architect of the Constitution, landed himself in the lap of Buddhism at the end of his life. Then the question arose why Ambedkar went beyond the Constitution when it guaranteed rights to the Scheduled Castes and Scheduled Tribes as equal citizens of the country. He was also clueless about Ambedkar’s call for maitree (friendship), instead of equality guaranteed by the Constitution. Dr. Harish Wankhade from the Centre for Policy Studies, JNU, observed that spectacle of despair had marked the country since 2014. Deft planning of a strategy by RSS-BJP combine led to the rise of the saffron party in UP, Bihar, Karnataka and Maharashtra. In UP OBCs minus Yadavs were wooed and Scheduled Castes minus the Jatavs were lured to back the BJP. Thus more than 41 percent votes of the OBCs, and SCs went in favour of the party, leaving Yadavs and Chamars along with the Muslims and the Left aside. It was the victory of the upper castes, OBCs other than the Yadavs and the Scheduled Castes other than the Jatavs. But, now, he noted, things had altogether changed and Dalits were feeling cheated by the BJP. Their anger against the party was growing. He emphasised that the social engineering used by BJP as a tool earlier must now be used by the forces of social justice to unite anti-BJP vote. This was being evidenced in Maharashtra where Prakash Ambedkar had entered into an alliance with Majlis-e-Ittehadul Muslimeen. Similarly in UP, he said, the Samajwadi Party, Bahujan Samaj Party and Muslims commanding a vote share of 41% were coming together to form a formidable block to upset the BJP. The experiment of bringing Dalits, Bahujan Samaj and Muslims together was being tried so that these communities could emerge as potential rulers. This would be a new experiment in the last 50 years. The secular politics of the Congress had lost its relevance because people got nothing from it. It might give some solace if the Congress came to power after 2019 Lok Sabha polls, but nothing substantial was likely to come out. He firmly believed that the lot of the deprived communities could be ameliorated only when their own people were at the helm of power. Piyush Babele, opinion editor of the Zee News portal, held that there were three types of nationalism in the country: Hindu rashtravad, Sanskriti rashtravad and Rashtravad. Besides, there was an idea of Dalit rashtravad propounded by Dr Ambedkar who wanted to create a Dalitistan. There was Jinnah’s Muslim nationalism and Sikh nationalism. At the bottom of rashtravad was hatred. This hatred might lead to struggle between Dalits and upper castes in the next 60 years. He said that today the atmosphere in the country was not as communal as it was in 1947. A feeling of insecurity regarding unemployment and poverty had gripped all communities. He said that the RSS gave respectability to the OBCs by making them a part of its social engineering project. Gandhiji who have to be followed who gave the Dalits a place of pride for the sake of the country. He asked Muslims to undergo the process of Renaissance as did Hindus by abolishing ill-practice of sati and dowry. 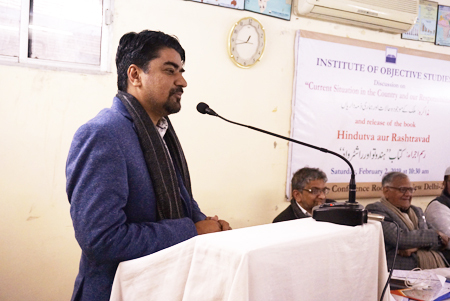 Naved Hamid, President, All India Majlis-e-Mushawarat, called for a debate on whether India was ever a secular state. He said that western model of secularism was entirely different from the Indian because the country failed to commit itself to preserve cultural pluralism. He spoke of his dislike for Hindu-Muslim narrative. He held capitalists responsible for the Partition of the country, besides Jinnah and Congress. When Bhartiya Jan Sangh was formed, it was funded by capitalists. He said that when the interim government was formed, Liyaqat Ali became its finance minister. But when he proposed to levy corporate tax, he was opposed by the Birlas, among other business houses. He maintained that India’s history was communal and this must be thoroughly researched. Why no research was being undertaken to find out how the Adi Shankaracharya drove out Buddhists. Muslims were being attacked because they resisted the attempt of their assimilation with the Hindutva ideology. Christians were not targeted for almost 34 years, but when they refused to be assimilated, they were constantly attacked after 1980. While rejecting the politics of alliances, he said that Muslims should cultivate their own leadership. It was high time Muslims realised the importance of social engineering and worked for Dalit-Muslim unity. Had the Muslims not opted for Pakistan, the country’s demography would have been entirely different. He concluded with a quote from former external affairs minister, Salman Khurshid, who once said that the Congress too had “some good RSS men”. He ventured that the communist parties too had good RSS men. He castigated the CPM for working against the interests of Muslims in West Bengal. 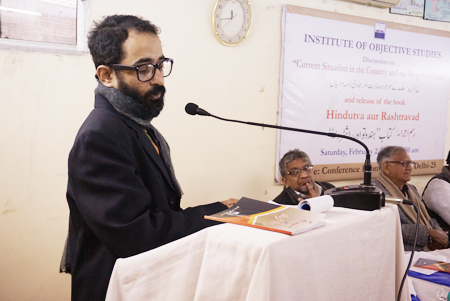 Journalist Anil Chamadia held that the present environment was the outcome of Lok Sabha elections-2014, but it developed over a period of ten years. The then Prime Minister Dr. Manmohan Singh used to say that the threat to the country was not from the outside, but from within. This was repeated by the present national security advisor, Ajit Kumar Dobhal, in his Patel Memorial Lecture recently. He remarked that a sizeable section in India, including a large number of Sikhs, Buddhists and Muslims had opposed the Partition of the country. He said that two slogans predominated the political scene before Independence - one was the Dalitisation of politics and the other was the Hinduisation of politics. While the first was the assertion of Dr. Ambedkar and the other was propounded by the RSS. Both the slogans could not be understood in the framework of a political party. Golwalkar too used to say that India faced internal threat and this threat was from none else, but Muslims, Christians and leftists. He treated them as enemies since they talked of equality. Those who raised the demand for equality were always dubbed as radicals. Golwalkar questioned the protest against raising the age of marriage of a girl from ten years. One needed to understand the process of the Hinduisation of Indian politics. He also criticised Muslim organisations for taking out procession with the banners reading “Islam is against terrorism” and said that this further gave legitimacy to the communalists who linked Muslims to terrorism. That RSS elements were present in every party was corroborated by admission of the RSS itself that it had presence in every political party, he added. He said that the RSS snatched away the social engineering slogan from the rest of Indians. 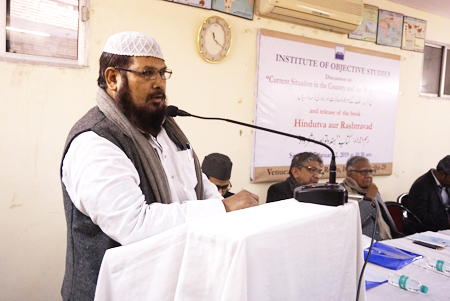 Mufti Nadir Qasmi of the Islamic Fiqh Academy held that Muslims had to work to further the cause of secularism. Badrul Islam Khan, lecturer in political science at Al-Falah University pointed out that Maulana Noumani did not come out with a prescription against Hindu nationalism. Islam stood for praying to Allah and serving humanity. He said that Dr. Ambedkar was surprised to know that castes existed among Muslims also. The existence of caste system among Hindus could be understood because of the theory of karma, but it was unthinkable among Muslims, he remarked. 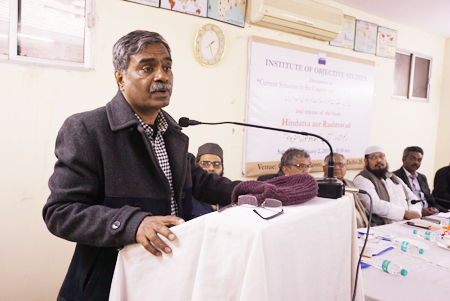 The Chairman, IOS, Dr. M. Manzoor Alam, underlined the importance of the issue. Listing the major projects the Institute had undertaken, he said that by and large people were ignorant about India. He wanted a thorough debate on this issue because it was history that guided people to shape their future. The Hindu-Muslim question was as old as India’s history. Things would be clear if the Constituent Assembly debates were gone into. Taking strong exception to the negative role of the media in highlighting Muslim issues, he gave the instance of the media blackout of a rally organised by the All India Milli Council on the Ram Lila ground in Delhi on April 6, 2013 in which more than one lakh people participated. The Bangalore meeting of the AIMC also met with the same fate. Calling for an impartial enquiry into the major riots that took place in Independent India, he said that the complicity of the RSS in them would be proved without an iota of doubt. He called upon both Hindus and Muslims to save each other during riots. India’s future would remain safe and secure if Indians pursued the principles and goals outlined in the Preamble to the Indian Constitution. 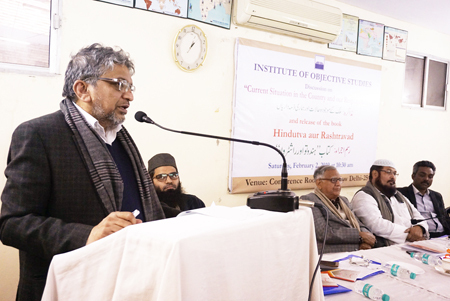 The Secretary General, IOS, Prof. ZM Khan, explained that the Institute did not visulaise communalism merely from a political angle. IOS had been seized of the problem and several seminars on the issue were organised by it in the past. Communal riots were an industry and its economics was important. Since the riots were staged with funding from business people, a research on its economics had become a must. He said that delimitation of constituencies and propaganda were the two most powerful tools to isolate Muslims and the Scheduled Castes. A package after this government came to power in 2014 had been completed. Thus it had become incumbent upon everyone to study losses suffered by all sectors after this government assumed power. He sought cooperation of enlightened sections for the success of the IOS in the pursuit of its goals. Earlier, the seminar began with the recitation of a verse from the holy Qur’an by Hafiz Athar Husain Nadwi. 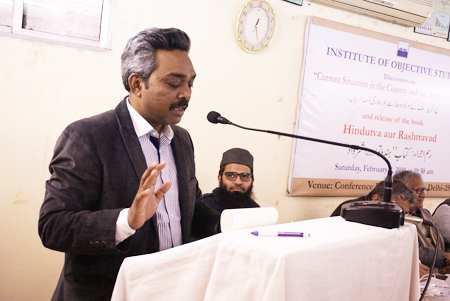 In-charge, Urdu section, IOS, Maulana Shah Ajmal Farooq Nadvi conducted the proceedings and extended a vote of thanks. The seminar was attended by university teachers, research scholars, social activists and prominent citizens, including the asstt. secretary general, IOS, Prof. Haseena Hashia.